No matter which organization you choose to support, just help fight breast cancer! Here are some products that you can get gorgeous with while doing your part. 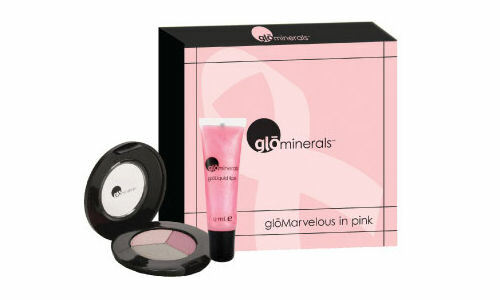 gloProfessional has exclusively created the You Look Marvelous in Pink kit ($30) to benefit the National Breast Cancer Foundation. This charitable kit includes a gloEye shadow trio in a new shade, Ballerina, and gloLiquid Lips, a lip gloss in the new shade Pink Ginger. Sabon is doing their part by offering The Pink Bath basket ($90) which includes Body Gel Polisher in Lavender, one rose scented fresh-cut bar of olive oil soap, one small Bath Foam in Lavender, Sorbet Body Gel in Lavender-Apple, two small round musk candles, a loofah towel, and one rose bath ball with rose petals. 30% of proceeds will go to The Breast Cancer Research Foundation. The online boutique, Kate’s Paperie, is donating 15% of the proceeds to The Triple Negative Breast Cancer Foundation from their sale of Gianna Rose Atelier scented soaps ($32). 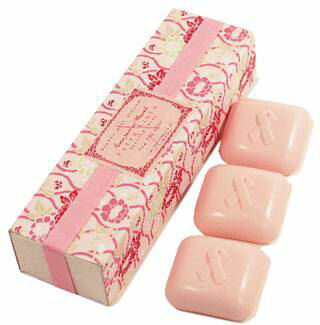 These French-milled soaps are scented with fresh linen and embossed with a pink ribbon, perfect for gift giving. Help heal dry skin with Palmer’s. 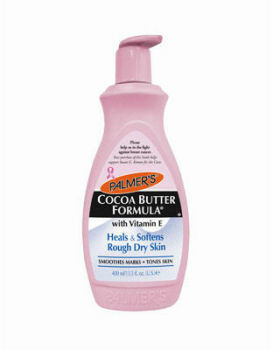 In honor of Breast Cancer Awareness Month, Palmer’s will donate proceeds from the sale of their pink specially marked Cocoa Butter Formula, Olive Butter Formula and Shea Butter Formula Lotions to Susan G. Komen for the Cure. Available at drugstores, prices vary. Even in this cold weather, beautiful feet is a must! Maintain smooth callus-free feet with the limited edition Pink PedEgg ($10). This handy gizmo has more than 135 micro files, fits perfectly into the palm of your hand, and all skin shavings fall into its storage compartment, so it can be used whenever you need it without making a mess. $50,000 of the proceeds will be donated to the Breast Cancer Research Foundation. These are all great ways to support cancer awareness. You can also send a text message to help fight Breast Cancer. mGive (text) ‘KOMEN’ to 90999 to donate $5 to Susan G. Komen For The Cure! Spread the word! I am a breast cancer survivor of 5 years. 1 & 1/2 years ago I trademarked adn patented a design of a 4 in 1 fashion headscarf I made years ago that helped me through my chemo and hair loss. It is called the ABonita Scarf. You can check out my website. I have been attending trade shows across the country and am now in over 185 boutiques nationwide. They are not only for hair loss due to health issues they are also sold in biker stores (bikers love them because they are more feminine than a “doo-rag”) marina stores, wig shops, high end fashion boutiques, hat stores, resort boutiques and pharmacies and cancer boutiques. I have donated ABonita Scarves to many charity events and the Compassionate Hands and Hearts foundation. I am also donating 10% from all internet sales to the American Cancer Society. I feel anyone going through cancer should register with them, they helped me with travel expensise to and from my chemo and radiation treatments as well as paid 100% for any pain medication I needed. I also would go to their office and get free wigs, hats, scarves, bras etc. Check out my website, pick out a scarf and I will send you a free sample!